The Lexus RX 450h introduced the second generation Lexus Hybrid Drive technology, and is the third generation of the original luxury SUV. Lexus has drawn on more than a decade of experience in full hybrid powertrain technology to bring about improvements in every aspect of the vehicle's Lexus Hybrid Drive system. 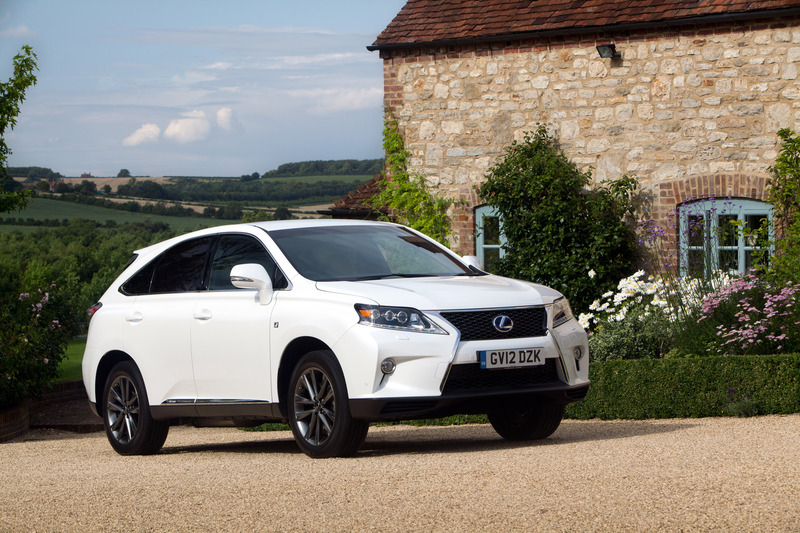 As a result, the Lexus RX 450h's real-world efficiency has been significantly improved, with a 10 per cent increase in engine power, a 28 per cent reduction in combined cycle fuel consumption, a 30 per cent improvement in cold weather fuel efficiency and an unparalleled reduction in CO2 emissions. The model underwent its first significant revisions, the changes led by a redesign of the front end that incorporates the new trademark Lexus spindle-shaped grille arrangement. Equipment specifications were improved across the board and a new F Sport version was added to the range - the first time the RX has been offered in Lexus's sport-themed trim. As well as sporty styling elements for the exterior and the cabin, the F Sport is equipped with a lateral damper system for sharper handling and a better ride. Unlike mild hybrids, which use supplementary electric motor power simply to boost the performance of the petrol engine, the RX 450h is a full hybrid, capable of operation in both petrol and electric modes alone, or in a combination of both. It combines the fuel efficiency and reduced emissions benefits of a series hybrid with the acceleration benefits of a parallel hybrid. It uses a series/parallel hybrid system, employing a highly efficient V6 petrol engine and two powerful electric motors working in tandem to provide an 'intelligent' four-wheel drive capability. Total power output is 295bhp (220kW), enabling a top speed of 124mph and nought to 62mph acceleration in 7.8 seconds. Conversely, the RX 450h has a combined cycle figure of 44.8mpg and its CO2 emissions are also remarkably low at 145g/km. The 3.5-litre DOHC petrol engine has been adapted specifically for use in the hybrid powertrain. It produces a maximum 246bhp (183kW) at 6,000rpm and 317Nm of torque at 4,800rpm, and features three Lexus hybrid 'firsts' to optimise the fuel efficiency: Atkinson Cycle, Cooled Exhaust Gas Recirculation (EGR) and Exhaust Heat Recovery (EHR). The hybrid drive system benefits from refinements in drivability through expanded electric motor maximum torque bands and an AI-SHIFT transmission control strategy to optimise engine efficiency. Selectable driving modes, Eco, EV, Snow and Sport, further improve the system's fuel efficiency and driving performance. EV mode, available only with the full hybrid capability of Lexus Hybrid Drive and not available to drivers of mild hybrid vehicles, allows the car to be driven under electric power alone, with minimal noise and zero CO2 and NOx exhaust emissions. 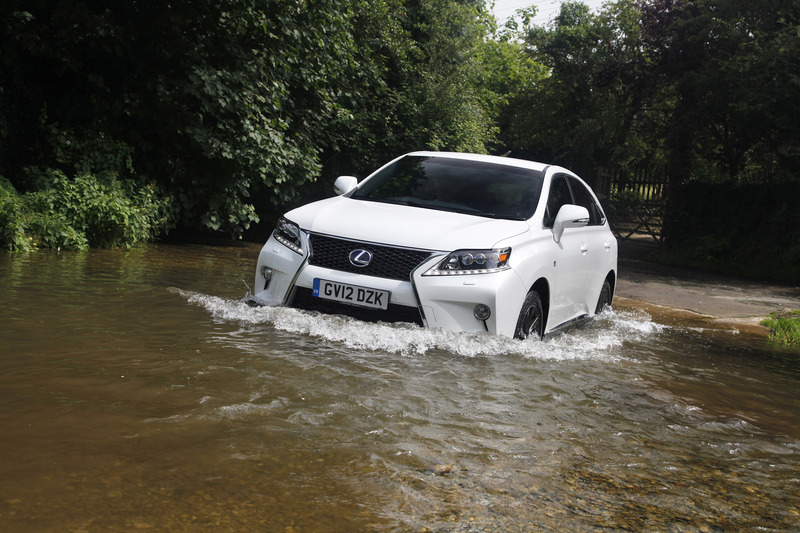 The RX 450h was designed specifically to meet the dynamic handling requirements of the European market. It delivers the high-speed cruising comfort and composure of a premium saloon, responsive handling and agility on winding roads and, through its electric four-wheel drive system, stable and tenacious performance. A double wishbone rear suspension configuration, allied to an increase in wheelbase length and track width, improves body roll and pitch control. The front suspension has also been extensively re-engineered, with new shock absorbers, optimised springs, anti-roll bar and component geometry. Electronically Controlled Suspension (standard on the Premier model) gives the driver a choice of four vehicle height settings over a 60mm range and automatically lowers when travelling at speed to optimise aerodynamic performance, stability and fuel economy. The effect is even more pronounced in the F Sport model, which has a deeper, more vertical front bumper and a dedicated mesh treatment for the upper and lower grilles. All models gain new-look rear light clusters. The Lexus RX 450h combines the road presence of a premium SUV with the most compact packaging possible. It is 15mm longer, 40mm wider, 10mm higher and has a wheelbase that is 25mm longer than its predecessor, increases that have been kept to a minimum in order to preserve the car's agility and town-friendly manoeuvrability. The reduction of panel gaps and the management of airflow under the vehicle combine with several multi-function aerodynamic elements to minimise turbulence and give the RX 450h a drag coefficient (Cd) of 0.32. Inside the vehicle, the cockpit design showcases numerous advanced features. The dashboard is divided into two distinct zones: an upper Display Zone, which includes the Head-Up Display and an eight-inch LCD multi-display screen; and a lower Operation Zone, which contains system controls such as the steering wheel-mounted multi-information switch and Remote Touch control. The cabin benefited from a number of small but telling tweaks to the trim details and the shape and functionality of some of the controls. The Lexus RX 450h marked the debut of Remote Touch control, an integral part of the Lexus Navigation System. It operates on the same basic principles as a computer mouse, and is quick and intuitive to use, with icons presented on the central multi-display screen that give access to adjust the audio, navigation, ventilation, phone and set-up systems. The system's operation was further refined to make it even more simple and intuitive to use. The Head-Up Display (F Sport and Premier grades) presents key driving data in the driver's line of sight at the base of the windscreen. Information is shown in white for perfect clarity in all conditions, and includes vehicle speed, turn-by-turn navigation instructions, audio information and, where fitted, Adaptive Cruise Control and Pre-Crash Safety system status. A multi-information toggle switch on the steering wheel lets the driver activate and customise numerous vehicle functions and information systems without taking a hand off the wheel. The control is linked to a white OLED multi-information display set within the instrument binnacle. Other key features include a Smart Entry and Start system, automatic moving of the driver's seat and steering wheel for easy entry and exit, dual-speed power windows and a high-efficeincy dual-zone climate control system. Lexus builds on its established high standards in in-car hi-fi with three powerful audio systems for the RX 450h. These include a top-of-the-range 15-speaker Mark Levinson Premium Surround System that gives perfect 7.1-channel surround sound. Using the navigation system's Hard Disc Drive, the audio system has a 'sound library' facility that uses Compact Disc Data Base technology to transfer and store up to 10Gb of music files. The navigation system, accessed by the Remote Touch control, has a 40Gb HDD capacity, making it one of the fastest and most accurate on the market. It covers the whole of Europe and includes traffic information infrastructure and 3D mapping. The RX 450h's Pre-Crash Safety (PCS) system - an option on Premier grade - sets a benchmark for anticipatory, preventive safety. Operating at speeds above 3mph, it uses a millimetre-wave radar sensor to detect objects ahead, determines the collision risk and helps the driver reduce the chances of an accident happening. If PCS judges a collision to be highly possible, it will alert the driver and, when he or she begins to brake, it will activate Pre-Crash Brake Assist to supplement the driver's braking effort. If the driver does not brake and a collision is inevitable, the Pre-Crash Brake will automatically apply the brakes to reduce impact speed. The Pre-Crash Seatbelt is also activated under emergency braking, or if there is a risk of a loss of vehicle stability. Adaptive Cruise Control (ACC) works in tandem with PCS at speeds between 31 and 106mph (50 to 170km/h), automatically maintaining a selected distance from the vehicle in front, and returning to the original cruising speed once the road ahead is clear. Lexus's Vehicle Dynamics Integrated Management (VDIM) system processes vehicle status data from sensors located through the car, integrating the function of the ABS, traction control (TRC), Vehicle Stability Control (VSC) and Electronically Controlled Brakes (ECB) with the electric power steering, and also co-ordinating control of the Lexus Hybrid Drive and electric four-wheel drive systems. The RX 450h's Lexus Hybrid Drive System represents a significant development of the world's first high-performance, full hybrid drive. Introduced in the RX 400h, this system was the first to successfully add a true performance dimension to the traditional hybrid advantages of fuel economy and low emissions, an achievement that revolutionised powertrain technology in the premium segment. Lexus has drawn on more than a decade's experience in full hybrid powertrain technology to improve in every aspect of its second generation Lexus Hybrid Drive. The result is a marked increase in engine power, a significant improvement in fuel economy and an unparalleled reduction in CO2 emissions. The system's real-world efficiency has also been comprehensively re-evaluated. It benefits from substantial improvements in cold weather operational efficiency, perceptible refinements in driveability thanks to wider maximum torque bands for the electric motor, and a new transmission control strategy to optimise engine efficiency. Four driving modes, Eco, EV, Snow and Sport, further improve fuel efficiency and driving performance. The RX 450h is a full series/parallel hybrid, capable of operation in both petrol and electric modes alone, or in a combination of both. It combines the fuel efficiency and minimal emissions benefits of a series hybrid with the acceleration benefits of a parallel hybrid, while avoiding any of their respective disadvantages. As a result, it delivers performance on a par with conventional powerplants with a larger cubic capacity, while returning fuel consumption and emissions figures comparable to those of much smaller engines. 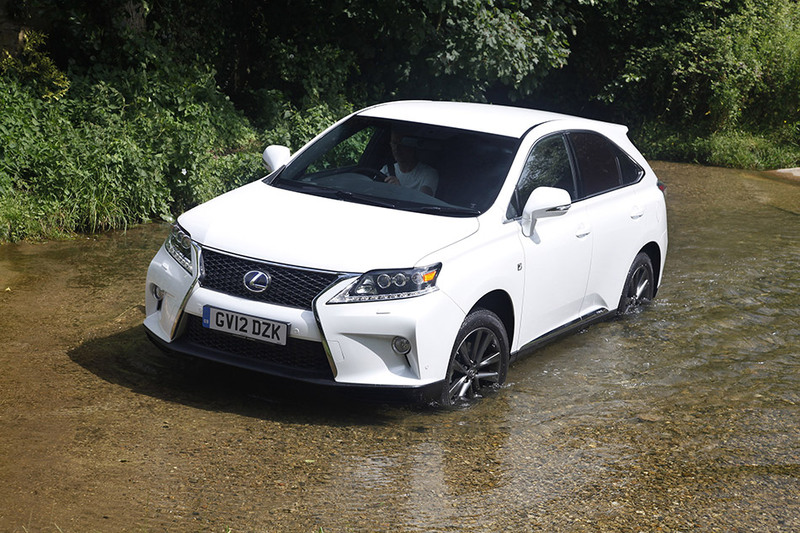 It shares the RX 400h's drivetrain configuration of a series/parallel hybrid system, employing a highly efficient petrol engine and two powerful electric motors working in tandem to provide an 'intelligent' four-wheel drive capability. However, comprehensive improvements to every aspect of the Lexus Hybrid Drive system dramatically improved overall efficiency, realising a 10 per cent increase in engine power and a 28 per cent reduction in fuel consumption. Lexus's long experience in full hybrid technology has been fundamental to achieving these improvements, most notably in the field of petrol engine efficiency, electrical energy management and battery technology. Total power output is 295 bhp (183 kW), enabling a top speed of 124 mph (200 km/h) and nought to 62 mph (0-100 km/h) acceleration in 7.8 seconds. 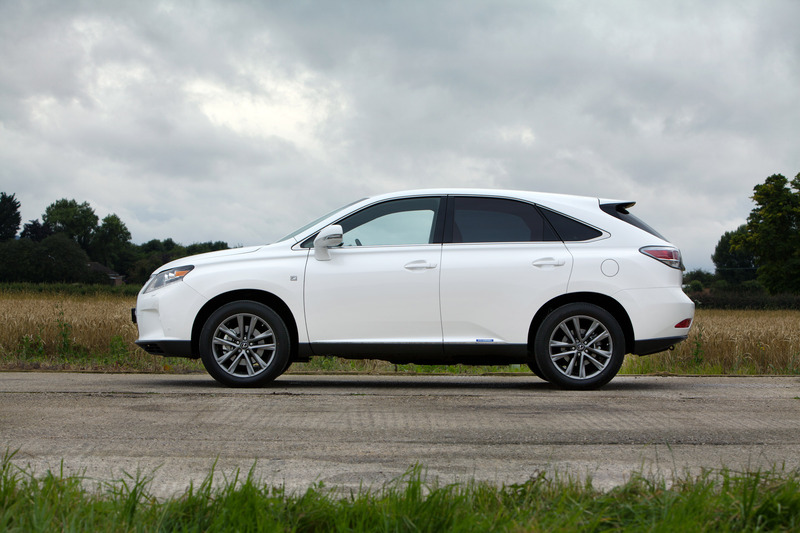 Conversely, the Lexus RX 450h has combined cycle fuel economy of figure of 44.8mpg. CO2 emissions are 145g/km (VED Band F). The full hybrid drive system combines two distinct front and rear driving units, with their seamless high-speed interaction managed by the power control unit (PCU). The front drive unit is a series/parallel hybrid system featuring a 3.5-litre V6 petrol engine, powerful electric motor, generator, high performance battery, power control unit and a power split device. The power split device uses a planetary gear set to combine and reallocate power from the engine, electric motors and generator, as required. The electric motor, generator, power split planetary gear mechanism and motor-speed reduction gearing are all housed in a single, lightweight, highly compact transmission casing. This packaging, comparable in size to a conventional gearbox, is fundamental to the successful installation of the Lexus Hybrid Drive system in a front-engine SUV platform. The rear unit provides four-wheel drive via a second electric motor. It is mechanically independent from the front unit and is activated and continuously adjusted by the Vehicle Dynamics Integrated Management (VDIM) system, working in conjunction with the PCU. The 3.5-litre DOHC petrol engine is adapted for use in the hybrid powertrain. It produces a maximum 246bhp (183kW) at 6,000rpm and 317Nm of torque at 4,800rpm, and features three Lexus hybrid 'firsts' to optimise fuel efficiency: Atkinson Cycle, Cooled Exhaust Gas Recirculation (EGR) and Exhaust Heat Recovery (EHR). In conventional four-cycle petrol engines, fuel enrichment is sometimes necessary to cool the exhaust gases to prevent degradation of or damage to the catalytic converters. In an Atkinson cycle engine the valves close late, delaying compression. This creates a high expansion ratio for less compression, reducing intake and exhaust energy losses and converting combustion energy into engine power more effectively. As a result the exhaust temperature is lower than in conventional engines. EGR reintroduces precisely metered exhaust gas - cooled from 880°C to 150°C - into the intake system, further reducing the engine's operating temperatures and, at the same time, reducing engine pumping losses through a reduction in intake vacuum pressure. Together these technologies minimise the situations where fuel enrichment is necessary to protect the catalytic converter from overheating damage, thereby improving fuel economy and reducing emissions. The EHR system uses exhaust gas heat to warm the engine coolant at start-up. This reduces the time the engine takes to warm up, allowing it to be shut off earlier for longer electric motor-only operation, particularly in winter. In tests conducted at -5°C, engine shut-off occurs more than 15 minutes earlier than in the RX 400h. 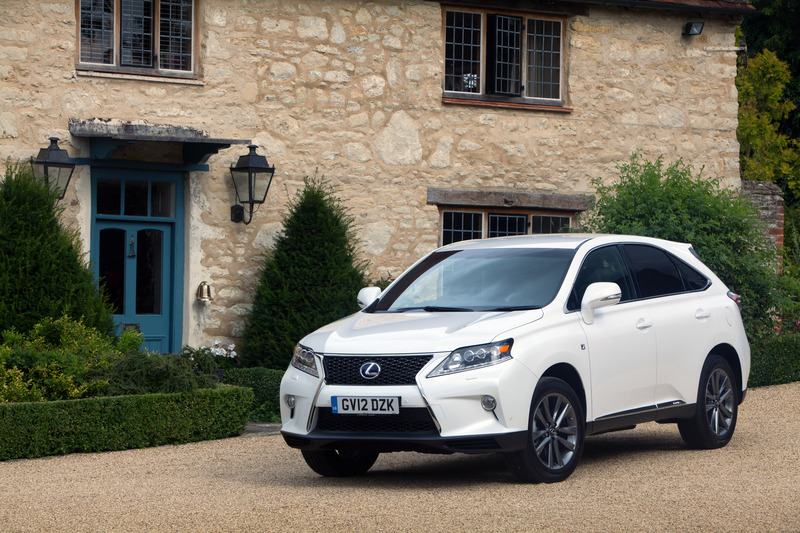 As a result, the RX 450h achieves an increase of more than 30 per cent in cold weather fuel efficiency compared to its predecessor. At the heart of Lexus Hybrid Drive is a remarkably compact hybrid transaxle, which incorporates several improvements. The adoption of an oil slinger has reduced oil pump drive losses; an oil cooler has been fitted; low friction bearings have been installed at key points; and numerous components have been tuned and re-profiled. These modifications combine to increase torque capacity and overall transaxle efficiency. An improved flywheel damper, with a two-stage, torque absorbing damper, absorbs torque fluctuations and also the shock of engine stop-and-start. This significantly reduces vibration and noise, notably in urban driving when the engine stops and starts most often. Artificial intelligence AI-SHIFT control has been adopted for the first time on a hybrid vehicle. The system determines whether the vehicle is travelling up or downhill by comparing vehicle speed with accelerator pedal angle. The transmission then selects the appropriate shift range - from third to sixth - to maintain engine rpm at an optimum speed for either uphill acceleration or downhill engine braking. Sequential shift-matic control is also available, by selecting 'S' in the transmission shift gate. In this mode the driver can select any of six speeds to gain more responsive performance, or to add engine braking assistance. Although power from the front and rear electric motors remains the same as it was on the RX 400h, at 165bhp (123kW) and 67bhp (50kW) respectively, the improved cooling of the PCU has increased their continuous maximum torque bandwidth. This gives better performance, particularly from a standing start. The front and rear motors deliver increased maximum torque of 335Nm and 139Nm from zero rpm respectively, while the range of the front motor's maximum torque is extended by 9mph and that of the rear by 22mph. The Power Control Unit is fundamental to the high speed operation of Lexus Hybrid Drive. It combines several essential functions, including boosting battery voltage from 288 to 650V DC; converting hybrid battery voltage from DC to AC to power the drive motors; controlling motor/generator operation; and converting hybrid battery voltage to 14V to supply accessory power and charge the auxiliary battery. The PCU is equipped with a new inverter and has been reduced in volume from 30 to 18.2 litres, with weight cut from 30 to 22kg. A more efficient, stacked inverter construction allows for cooling on both sides and this improved efficiency has helped increase the power density by 40 per cent. PCU power losses have been reduced by more than 10 per cent to improve fuel economy. Changes in the switching frequency of the operation circuit reduce switching losses and so further improve fuel economy, while higher operation frequencies reduce inverter noise. In a conventional, non-hybrid vehicle, the auxiliary battery is charged by an alternator. Because an alternator cannot operate during engine cut-off, a full hybrid vehicle needs an alternative system. The Lexus Hybrid Drive PCU incorporates a DC/DC converter to reduce the high voltage of the 288V system battery to 14V, appropriate for supplying power to the accessory systems and charging the auxiliary battery. The performance and functions of the RX 450h's DC/DC converter have been upgraded: the control method has been revised; an upgraded switching frequency is used; and an exclusive coolant path is provided, combining a higher power output with a more compact design. The three-block battery structure has been carried over from the RX 400h, but it has a more compact, lightweight design. It is mounted beneath the second row seats, without impeding their sliding or folding flexibility. The 288V pack is divided into three packs, each comprising 10 modules of eight cells. The battery pack, battery monitoring unit, junction block, service plug and three cooling blowers are housed in a sheet metal case. The blowers distribute air from the cabin through the structure, using compact but highly efficient and quiet fans. In the course of any journey, Lexus's full hybrid system will operate in different modes to maximise overall efficiency. At rest, the engine stops automatically to conserve fuel. Under conditions of low engine efficiency, such as at start-up or low to mid-range speeds, the vehicle runs on the electric motor alone, eliminating CO2 and NOx exhaust emissions. In normal driving conditions, power allocation is constantly adjusted between engine and electric motor to combine optimum performance with maximum fuel efficiency. In a feature unique to the RX 450h's Lexus Hybrid Drive, the rear wheels are driven by a second electric motor to provide an 'intelligent' electric four-wheel drive capability. Controlled by the Vehicle Dynamics Integrated Management (VDIM), working in conjunction with the PCU, four-wheel drive is automatically engaged via constantly adjusted front and rear electric motor torque under hard acceleration (both from standstill and through the gears), when driving through bends and whenever the front wheels lose traction. During deceleration and under braking, the engine switches off and both electric motors act as high-output generators, driven by all four wheels. This regenerative braking system optimises energy management by recovering kinetic energy that would normally be wasted as heat as electrical energy for storage in the high performance battery. The Lexus Hybrid Drive system monitors itself at all speeds for optimum performance and fuel efficiency with minimum emissions, either running the electric motors in isolation, the engine in isolation, or a combination of both. Furthermore, the battery power level is constantly managed via the engine-driven generator, so there is no need for it to be recharged using an external source. The fuel efficiency and performance of the RX 450h's hybrid drive system are further enhanced by four driving modes: Eco, EV, Snow and Sport. Linked to an indicator in the speedometer, ECO mode modifies throttle response to driver inputs for smoother, fuel-efficient driving. The air conditioning load on the engine is reduced sharply under acceleration, further adding to fuel efficiency. The RX 450h automatically operates in EV (electric vehicle) mode from start-up and at speeds up to 25mph, with vehicle range dictated by the level of battery charge. EV mode can also be activated manually, via the drive mode switch on the steering wheel. In EV mode the vehicle can be driven around town with minimal noise and zero tailpipe emissions. As the petrol engine is switched off, EV mode can contribute to an overall reduction in fuel consumption. Snow mode helps modulate use of the accelerator pedal and improve vehicle stability when pulling away on snow or other slippery road surfaces. Pedal inputs are automatically adjusted to reduce driving torque and minimise wheelspin; should there be any wheelspin, the rear electric motor engages to improve traction. Selecting Sport (using the drive mode switch on the steering wheel) modifies the throttle and electric power steering settings to gain faster responses, and also programmes the Vehicle Stability Control and traction control for less intrusive operation, letting the driver fully exploit the car's dynamic abilities. The shift to Sport mode is reflected in the ambient illumination of the instrument panel changing to red. 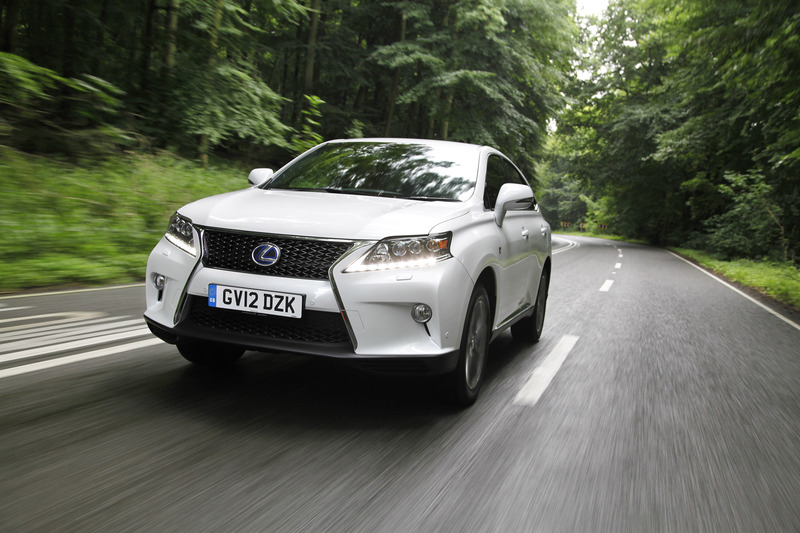 The RX 450h was designed to meet the dynamic handling requirements of the European market. It delivers the high-speed cruising comfort and composure of a premium saloon, responsive handling and agility on winding roads and, through its electric four-wheel drive system, stable and tenacious performance. A new double wishbone rear suspension configuration replaces the strut-type system used in the RX 400h. Allied to an increase in wheelbase length and track width, this enhances body roll and pitch control. The front suspension has also been extensively re-engineered, with new shock absorbers, optimised springs, anti-roll bar and component geometry. Electronically Controlled Air Suspension (standard on the Premier model) gives the driver a choice of four vehicle height settings over a 60mm range and automatically lowers when travelling at speed to optimise aerodynamic performance, stability and fuel economy. An all-new bodyshell with high torsional rigidity gives the RX 450h a 20mm increase in wheelbase and 70mm increase in track compared to the RX 400h. Eighteen or 19-inch wheels improve stability, reduce body roll and contribute to better NVH performance. The engine is positioned lower, lowering the vehicle's centre of gravity and improving overall vehicle weight distribution. The RX 400h's strut-type rear suspension has been replaced with a new trailing arm, double wishbone configuration that features high-tensile pressed steel components that are lightweight but highly rigid. The system's wider arm span and rigid trailing arm and carrier joints contribute to a high level of agility and stability, while careful attention to packaging, including locating the springs under the vehicle floor and low, angled shock absorber mountings, minimises suspension intrusion into the luggage floor. As a result the loadspace floor width has increased by 150mm. Dynamic characteristics, such as compliance steer, steering resistance and bump steer have been given an optimum balance that communicates steering inputs directly to the tyres to give highly responsive handling. The load input compliance has been tailored by using oversized, seated-type bushes to reduce harshness and give outstanding ride comfort. Optimised linear posture under braking has been achieved by improving anti-lift and anti-squat ratios, reducing nose dive under braking and rear end squat under acceleration. A linear toe curve further stabilises sprung weight dynamics, ensuring stable, controlled, saloon-like cornering with minimum roll. The MacPherson strut front suspension has been comprehensively retuned for improved agility, stability and ride comfort, gaining new shock absorbers and revised geometry, springs and stabilisers. The two front springs are inversely wound, compressing in opposite directions to cancel torsional forces and enhance manoeuvrability. The diameter of the front anti-roll bar has been increased, improving cornering stability. The RX 450h Premier is equipped with a newly engineered, electronically controlled air suspension system. This has a revised construction, combining pneumatic cylinders with high-capacity shock absorbers to deliver flat and supple ride comfort with superior road-holding. The system automatically maintains a level vehicle posture, regardless of how many people or what size load is on board. Four suspension heights are available, selected using a control switch by the driver's seat: Normal, High (+30mm), Low (-20mm front, -5mm rear) and a Loading mode (-30mm), available only when the vehicle is stationary. For convenience, a second Loading mode switch is located on the side wall of the luggage compartment, and the function can still be used when the hybrid system is switched off. Normal mode is automatically selected at vehicle start-up and is suitable for everyday driving. When travelling at motorway speeds, the system will automatically lower the suspension to a height equivalent to Low mode to improve aerodynamics, stability and fuel efficiency. The front suspension features MacPherson strut air springs with cylinders integrated in the shock absorbers. The air piston is located off-centre along the axis of the shock absorber, to reduce load on the shock. The system incorporates a urethane bound topper and flexible dust cover to protect the diaphragm. By using a multi-leaf linear control valve, damping force characteristics have been improved, contributing to greater ride comfort, manoeuvrability and stability. Adding a rebound spring suppresses in-turn bouncing and further reduces roll angle when cornering. The rear suspension has an independent shock absorber/air spring layout. The air piston has a tapered profile for ideal spring characteristics. As at the front, a bound stopper and flexible dust cover are used. A system compressor and dryer are incorporated into the right hand side of the rear bumper, with a double-layer mount ensuring minimal noise and vibration are transmitted into the cabin. The air in the compressor is dehumidified to prevent the system freezing in cold weather, with dehumidified air replenishing the system each time the vehicle is lowered. The drying element has been changed from conventional silica gel to a more effective synthetic zeolite, which improves air venting performance and reduces the time taken to lower the vehicle. An additional low pressure tank is used to lower the vehicle as quickly as possible when Loading mode is selected. The rate at which high pressure air can be vented is dependent on the regenerative capacity of the dryer, so in order to increase lowering speed, air from each cylinder is first sent to the lower pressure tank, then vented at an optimum rate. At this point air is regenerated in the dryer and released into the atmosphere at a time when vehicle height is not being adjusted. The Lexus RX 450h F Sport is not just about sportier looks, it also offers sharper driving dynamics thanks to a lateral damper system that increases stability and improves ride comfort by absorbing small vibrations. The system, similar to that introduced in the CT 200h F Sport, uses a front lateral damper in place of the usual fixed bracing between the left and right suspension towers. A second damper unit is deployed at the rear, connecting each side of the lower back panel. The units are designed like a monotube suspension damper and adjust in line with changes in the body rigidity, noise and vibration of their surroundings to give the best possible absorption of body torsion, flexure and fine vibrations. The RX 450h's rear wheels are driven by a second motor to provide electric four-wheel drive under certain driving conditions, improving traction and vehicle stability. Operation is controlled by the Vehicle Dynamics Integrated Management (VDIM) system, with automatic engagement via constantly adjusted front and rear electric motor torque under hard acceleration both from standstill and at any speed, when driving through corners and whenever the front wheels lose traction. Improved rear stability delivered by the new double wishbone rear suspension allows for a quicker steering ratio to be used than on the RX 400h. Thus the steering gear ratio has been reduced to 14.8, further improving agility. Electric power steering is fuel efficient, kinder to the environment and particularly progressive and responsive in operation. Steering weight is seamlessly adjusted as vehicle speed increases, giving ease of use at parking speeds and good feel and control and high cruising speeds. In spite of the longer wheelbase and wider track, the turning radius is unchanged at 5.7m. A new constant ball-slide intermediate shaft has been developed to improve steering column rigidity. The constant slide function allows the shaft to adjust its length according to steering inputs, giving a smoother steering feel. EPS is simple and compact in its construction, with the motor, reduction gear and torque sensor integrated in the steering column. As there is no hydraulic fluid to maintain, the system is more environmentally efficient, with no risk of leaks and no recycling issues. Conventional hydraulic power steering systems have to run constantly to maintain pressure, but EPS uses current from the motor to provide assist torque only when needed. This leads to a significant reduction in energy consumption in driving conditions where little steering input is required, for example on long motorway journeys. Compared to a conventional hydraulic system, EPS can potentially deliver a gain of around three per cent in fuel economy. In addition to integrated VDIM steering control, the further benefits of EPS include a 30 per cent reduction in steering flutter, 40 per cent reduction in steering drift and up to three per cent less CO2 emissions. The steering wheel itself is a new 382.6mm diameter three-spoke design. The grip cross section has been revised for added comfort and the hand-stitched leather cover has an excellent tactile quality. Steering wheel rake can be adjusted through 48mm and reach through 40mm. Along with the driver's seat, the steering wheel is incorporated in the driving position memory system. Three positions can be programmed or recalled with one touch. An automatic away/return function makes access to the driver's seat easy: the system retracts the steering wheel to its highest and furthest forward position when the engine is switched off, returning it to the previous memory position when the vehicle is restarted. 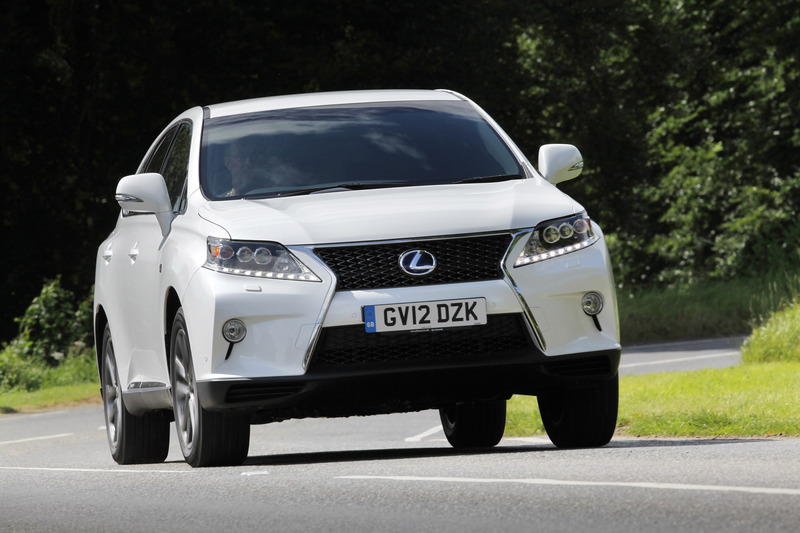 Lexus engineers optimised the RX 450h's braking effectiveness, controllability and rigidity. The second-generation Electronic Brake Control system has an independent power supply and works with VDIM to give improved brake pedal feel and linearity, optimum four-wheel independent brakeforce distribution, braking assistance and maximised energy regeneration. Ventilated discs are used front and rear, those at the front increased to 328mm diameter and those at the rear measuring 309mm across. An independent three-plunger-type power supply gives quieter operation. Lexus Hybrid Drive provides all four wheels with regenerative braking during deceleration and braking, recovering kinetic energy that would normally be lost as heat, as electrical energy for storage in the system's high-performance battery. Special attention has been paid to reducing NVH levels in the Lexus RX 450h's body structure, to ensure a calm cabin environment at all vehicle speeds. Apart from the NVH suppression measures inherent in the refined styling, body structure and ultra-quiet Lexus Hybrid Drive system, marked improvements in high-speed wind noise reduction have been achieved by using a three-layer, flush-mounted acoustic glass windscreen, high-performance weatherstrip door seals and rubber bonnet seals. Comprehensive use of high-performance soundproofing materials throughout the engine and passenger compartments has rigorously suppressed road and engine noise. These are strategically placed to reduce weight and curb sound transmission within the bonnet, fender seal, instrument panel, outer and inner dashboard surfaces, cabin floor, front and rear footwells and roof headlining. Felt-type wheel arch liners further minimise road noise, and additional sound-absorbent materials have been deployed in the cross-sections of the A, B and C-pillars to reduce noise transmission through the bodywork. Three damping braces on the front cowl both improve pedestrian protection and suppress windscreen vibration. A caulking sponge is applied between the cowl and windscreen which adds to safety performance and cabin quietness. The underbody is extensively treated with a highly rigid vibration damping coating, which both reduces weight and ride noise. The RX 450h showcases numerous advanced features and superb functionality that focuses on intuitive, user-friendly control operation for both driver and front seat passenger. The dashboard is divided into an upper Display Zone and lower Operation Zone, which places all the system controls within easy reach of driver and front passenger. Lexus's Remote Touch, an integral part of the Lexus Navigation System, is a multi-function device that offers intuitive control of the audio, navigation, climate, phone and vehicle set-up systems, located immediately in front of the centre console. It is radically different from remote devices offered by other manufacturers, operating on the same basic principles as a computer mouse. The adjustable control knob has a good ergonomic quality, giving the user tactile feedback, and allows the cursor to be moved quickly across a range of icons on the multi-display screen. To make it easier to select an icon, the system automatically 'pulls' the cursor to an icon if it passes close to it. This makes the system fast and easy to use, minimising driver distraction time. The way Remote Touch works was further refined to make it even simpler and more intuitive to use. Using technology that was originally developed for use in fighter jets, the Head-Up Display (HUD) projects key driving data into the driver's line of sight at the base of the windscreen, including speed, navigation commands, audio and (where fitted) Adaptive Cruise Control and Pre-Crash System status. The system is fitted as standard to F Sport and Premier models. Most head-up displays on the market use green-coloured read-outs, with white rejected as a colour choice because of the blurred effect that can be created against the exterior background. The white read-outs used by Lexus employ high-intensity LEDs to maintain clarity and visibility in all driving conditions, tested ahead of production on snow covered roads. The display position and lighting intensity can be adjusted and the light level can also be automatically adjusted in line with ambient lighting conditions. The Lexus Navigation System, accessed via the Remote Touch control, has a 40Gb HDD capacity making it one of the fastest and most accurate systems on the market. It covers all of Europe and includes access to the traffic information infrastructure of each country. The RX 450h features a white Organic Light Emitting Diode (OLED) multi-information display. Located between the main instrument meters, it is visible from a wide angle, so the front passenger can also read information on the screen. When the driver opens the door, the acrylic panels are activated and light up with increasing intensity. When the Lexus Hybrid Drive system is switched on, the needles and markings on the gauges illuminate, followed by the multi-information display. When the driver leaves the vehicle, this illumination sequence is reversed, gradually fading out the instrumentation section by section. The multi-information switch on the steering wheel is linked to the multi-information display and dramatically reduces the driver's need to use switchgear on the dashboard. This in turn permits a less cluttered dashboard design. Using a toggle switch, the driver can activate and customise numerous vehicle functions and information systems without lifting a hand from the wheel. The switch offers four modes: Switch, Meter Suggest, User Customised and Cruise Information. In Switch mode, the parking sensors, I-AFS headlamps and driving modes can be switched on or off. In User Customised mode the setting of functions such as the door locks, lights and meters can be personalised. If, for example, the engine is switched off and a window left open, the Meter Suggest mode will give an alert. Cruise Information mode lets the driver switch between different information displays, including average fuel consumption and estimated driving range. Seamless Anticipation - discreet hospitality that anticipates the user's needs - is another principle central to the L-finesse design philosophy and one which can be witnessed in the smart keyless access to the RX 450h and its sequenced illumination. As well as phased exterior and interior lighting, the needles, markings and multi-information display also light up in sequence when the RX is switched on. And when the driver leaves the vehicle, this illumination sequence is reversed. The instrument binnacle has hybrid blue lighting. This discreet hospitality is also evident in the electrically operated driver's seat, which has an automatic return and away system, in conjunction with a position memory function. When the vehicle is switched off, the steering wheel tilts up and forwards to its highest and furthest forward position and the driver's seat simultaneously slides back 50mm to make it easy to get in and out of the vehicle. When the engine is switched on again, they return to their memory positions. The dual-speed windows automatically slow at the beginning and end of their opening and closing sequence, reducing noise and vibration and reinforcing the all-round sense of luxury. 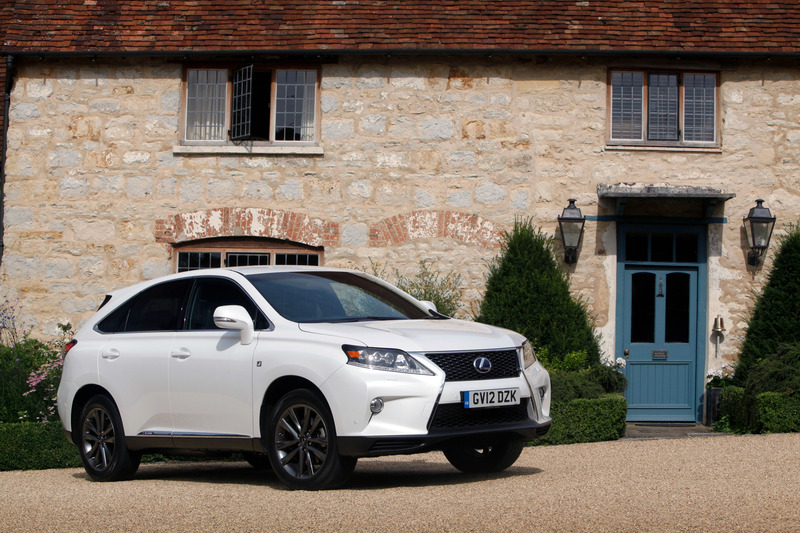 The Lexus RX 450h has automatic air conditioning with independent left and right temperature control. The system uses a new compressor, a highly efficient heat exchanger and an anti-vibration condenser mechanism that improves both cooling and heating functions and reduces operating noise. The compressor has a humidity sensor that improves system efficiency by taking ambient humidity level into account, contributing to a 0.8 per cent gain in fuel economy. Fan and vent noise levels have been substantially reduced and a clean air filter prevents pollen and dust from entering the cabin. An exhaust gas-detecting recirculation function automatically switches between fresh and recirculated air modes to maintain good cabin air quality. Designed on the principle of "clearer quality through an emphasis on direct sound", the three new audio systems for the RX 450h show Lexus building on the exceptional standards it has already achieved in in-car hi-fi. Every aspect of speaker layout has been re-evaluated. For example, creative positioning and angling of the tweeters and squawkers perfectly cross-channels sound to the occupant on the opposite side of the vehicle, creating a clear, crisp acoustic environment. The entry-level system (SE grade) comprises a six-disc in-dash CD changer, steering wheel-mounted controls and nine speakers. DAB-ready, it provides USB and audio jack plug connections for fully controlled use of portable music players such as iPods, and Bluetooth mobile phone connectivity with an audio/video streaming function. A 12-speaker system is also available, with all the above features and the Lexus Navigation System, fitted as standard to the Luxury and F Sport models. The design includes a tweeter mounted in each door to give improved sound clarity for the rear seats and surround sound effects in the front seats, producing a rich, natural feel. In addition, the 20cm sealed box subwoofer in the rear luggage compartment has an ingenious L-shaped profile to guarantee adequate volume and achieve deeper, more powerful bass notes. The top-of-the-range 15-speaker Mark Levinson premium surround sound system (standard on Premier grade) allows RX owners to enjoy perfect home theatre 7.1-channel surround sound from selected CDs and DVDs. It also makes use of the navigation system's hard disk drive (HDD) to provide a sound library facility, using compact Disc Data Base technology to transfer and store music files up to a 10Gb capacity. The system has several unique features that guarantee unparalleled sound quality. A centre channel coaxial speaker unit, comprising a 90mm metal cone mid-range and 16mm tweeter, widens the scope of supported frequencies to produce vocals and instrumentals with a greater degree of precision than that of a conventional system, while also matching harmonics between the front right and left channels. A 200mm Mark Levinson subwoofer in a 19-litre enclosure is independently powered by a 100-Watt Mark Levinson amplifier, allowing it to produce extremely deep bass and sound effects with ease. A 65mm Mark Levinson speaker is built into each D-pillar to provide the appropriate right and left sound channels. Sound diffusion has been optimised so that everyone on board can enjoy the same audio quality. For further entertainment options when on the move, RX 450h is available with an optional ICE package comprising two tablets securely mounted to the rear seatback of the front seats. Each tablet comprises an eight-inch WVGA screen, integrated DVD player, USB 2.0 reader and SD card reader. The screens operate independently of each other, so one passenger can watch a disc while the other plays computer games. The package includes two pairs of infra-red headphones, sized so that they will comfortably fit young children, plus a remote control. The USB 2.0 connection and SD card reader allow video clips, music and photos to be viewed from a memory stick or card. It is available as an option on all grades. A new Side Monitor makes its debut in the Lexus RX 450h, in addition to the Rear View and Parking Assist monitors. The system, fitted to the Premier model, uses Charged Coupled Device (CDD) cameras built into the passenger door mirror and the rear of the vehicle, which work in conjunction with the front and rear parking sensors to give a view of areas around the vehicle that are difficult to see from the driver's seat. Real-time images are shown on either the central display (on models equipped with the Lexus Navigation System), or the interior rear-view mirror. For added security, the door mirror camera will continue to work even if the mirrors are folded back when negotiating a narrow space. 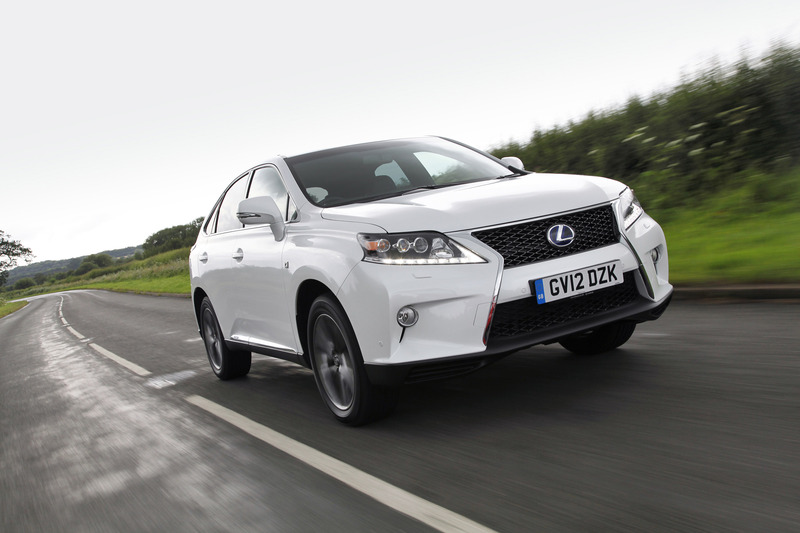 The RX 450h combines the road presence of a crossover with the most compact packaging possible. It is 15mm longer, 40mm wider, 10mm higher and has a wheelbase that is 25mm longer than its predecessor, but these increases have been kept to a minimum in order to preserve the car's agility and town-friendly manoeuvrability. RX maintains its 5.7m turning circle. Styling changes are led by spindle-shaped arrangement of the upper and lower front grilles that is a central element in new Lexus design, as also seen in the fourth-generation GS saloon and the multi-award winning LF-LC concept coupe. The effect is to give RX 450h a much stronger and individual street presence, a character that is even more pronounced in the new F Sport model. This has a deeper, more vertical front bumper and a dedicated mesh treatment for the upper and lower grilles, which together make the new spindle grille shape an even stronger feature. The cab-forward silhouette preserves the classic look of a crossover, while the clear axis of the shoulder and distinct crease along the C-pillar form a new architectural framework. The pronounced wheel arches flow seamlessly into both bumper and doors, and the vehicle's taut rear corners are emphasised by the smooth integration of the bumper. Distinctive side window mouldings adopt the L-finesse arrowhead shape, following a subtly concave line across the A and C-pillars before extending at either end. The plated door base mouldings increase in thickness towards the rear of the vehicle, giving a sense of strength and lowered centre of gravity. 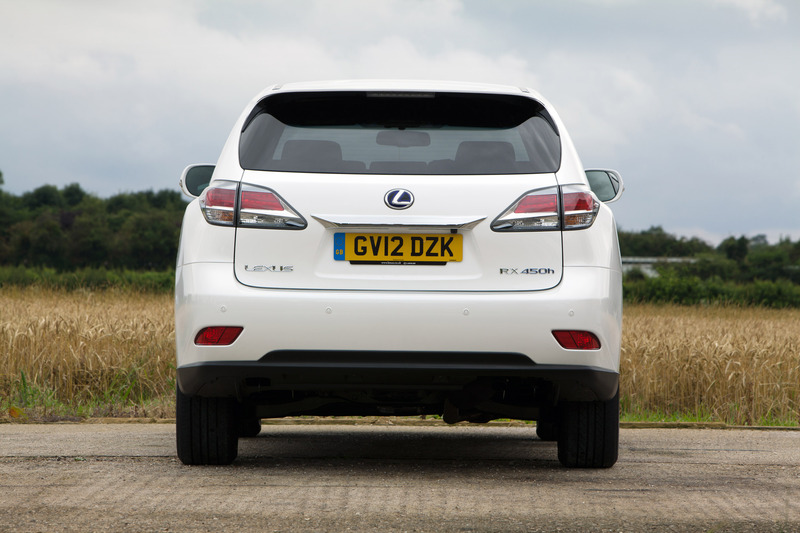 The reduction of panel gaps and the management of airflow under the vehicle combine with several multi-function aerodynamic elements to minimise turbulence and give the Lexus RX 450h a class leading drag coefficient (Cd) of 0.32. These elements include highly sculpted door handles with a touch sensor smart switch in place of a button release on the front doors. The large, multi-function door mirrors also have a sculpted appearance, combining a rounded upper surface with a cut-away lower surface. This new design reduces wind noise by 20 per cent compared to those on the previous RX. The mirrors incorporate LED turn indicators that also function puddle lights and, where specified, a parking camera on the passenger side. The rear wiper is concealed beneath the spoiler, which has a blacked-out underside to give a sleek appearance. As well helping reduce the vehicle's Cd value, it also houses a high-mounted stop lamp and radio antenna. A number of exterior design details identify the RX 450h as a Lexus hybrid model. At the front, the grille has a blue-tinted Lexus emblem and the bumper is reworked to include an extra intake. The headlamp clusters are also blue-tinted. To the side there are blue scuff plates and a hybrid logo and at the rear the lamp clusters are again shaded blue and there is further hybrid badging. Interior width has been increased by 52mm between the armrests, the front-to-rear couple distance is 10mm longer, and the length of the boot space is 10mm longer, compared to the RX 400h. This contributes to a spacious and comfortable cabin environment. The cockpit design addresses the need for drivers to take in a lot of visual information without losing attention on the road ahead. The space is divided into two distinct zones: an upper Display Zone, which combines a head-up display (F Sport and Premier grades) with an eight-inch colour LCD multi-display screen, and a lower Operation Zone, which gives access to controls such as the multi-information switch on the steering wheel and Remote Touch. All functions are arranged so that they can be operated by both driver and front seat passenger. The full-leather, electrically adjustable front seats are more comfortable thanks to increased backrest height and width and cushion thickness and width. Electric cushion length adjustment is included in the 10-way seat control for the front seat in the RX 450h Premier. New heaters provide heat at different temperatures across different parts of the seat. The rear seats maintain the proven 40:20:40 split-folding configuration, which offers more flexibility and practicality than the usual 60:40 format. The seats can be slid forwards and backwards to increase legroom or luggage capacity, and can also be reclined. The interior is designed to provide flexible and practical storage space. There are numerous compartments, including cup, coin and card holders; various trays; a locking glove box; capacious front and rear door pockets; an overhead console; and a multi-compartment centre console, which has 12V power outlets and is large enough to store the owner's manual and provide an additional 21 litres of space. The adoption of a double wishbone rear suspension design reduces the degree of intrusion into the luggage compartment, increasing loadspace floor width by 150mm and overall volume to 446 litres. New levers are located on the side wall of the load area to enable remote one-touch folding of he rear seats. Models fitted with air suspension also have a vehicle height switch on the side wall for easy adjustment when loading or unloading. The Lexus RX 450h is available in nine exterior colours: Starfire Pearl, Mercury Grey, Velvet Black, Celestial Black, Vanilla Mist, Burgundy Red, Atlantic Blue, Satin Silverand Sienna Brown. Interior trim choices are ivory, light grey, saddle tan or black leather (high quality semi-aniline leather on Premier grade) with dark grey gloss trim. Black leather is standard on the F Sport model. An optional Wood Pack providing wood trim inserts and a wood-trimmed steering wheel, is available for Luxury and Premier grades, the latter including a heated steering wheel. The RX 450h sets high standards for active, passive and preventive safety with impresive body strength, award-winning safety innovations and driver support systems. Lexus aims to offer a maximum content of safety features that are effective in real-world situations. It performed 233 crash tests during the vehicle's development, data from which helped produce a range of advanced safety technology that redefines occupant protection through unprecedented synergies between driver intent and vehicle response. The dual-zone cockpit design provides excellent ergonomics and maximum instrument clarity, helping drivers to concentrate on the road ahead. The head-up display combines with the multi-information screen to keep all essential data within the driver's field of view, and a multi-information switch lets the driver monitor vehicle information while keeping both hands safely on the wheel. For safer night driving, the Intelligent Adaptive Front-lighting System (I-AFS) works in conjunction with the low beams of the LED headlamps and both the high and low beams of High-Intensity Discharge (HID) headlamps. When entering a corner, the system calculates where the vehicle will be in three seconds' time, based on vehicle speed and steering angle, adjusting the lateral aim of the lamps accordingly. The RX 450h's Pre-Crash Safety (PCS) system (an option for the Premier grade) sets a benchmark for anticipatory, preventive safety. Operating at speeds above 3mph, it uses a millimetre-wave radar sensor to detect objects ahead, determines the collision risk and helps the driver reduce the chances of an accident happening. If PCS judges a collision to be highly possible, it will alert the driver and when he or she begins to brake, it will activate Pre-Crash Brake Assist to supplement the driver's braking effort. If the driver does not brake and a collision is inevitable, the Pre-Crash Brake will automatically apply the brakes to reduce impact speed. The Pre-Crash seatbelt is also activated under emergency braking, or if there is a risk of a loss of vehicle stability. Adaptive Cruise Control (ACC) works in tandem with PCS at speeds between 31 and 106mph (50 to 170km/h), and forms part of the combined option offered on the Premier grade. ACC automatically maintains a pre-set distance from the vehicle in front, returning to the original cruising speed once the road ahead is clear. 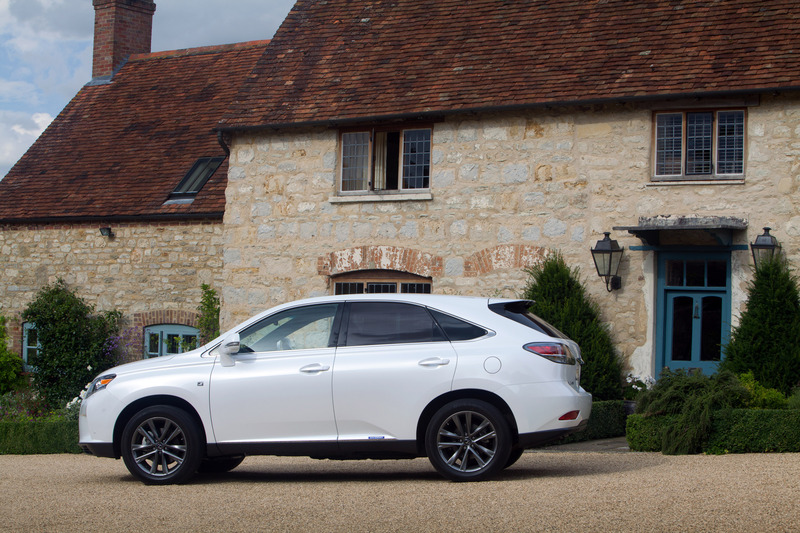 The Lexus RX 450h also features Hill-start Assist Control (HAC), which functions both when driving forwards and reversing. HAC briefly maintains brake pressure as the driver moves his or her foot from the brake to the accelerator, to prevent the vehicle from rolling backwards on an incline. Because the system requires less accelerator input, it reduces wheelspin and gives smoother pulling-away performance. Lexus's Vehicle Dynamics Integrated Management (VDIM) system processes vehicle status data from sensors located throughout the car, integrating the function of the ABS, Traction Control (TRC), Vehicle Stability Control (VSC) and Electronically Controlled Brakes (ECB) with the electric power steering, and also co-ordinating control of the Lexus Hybrid Drive and electric four-wheel drive systems. Through its integrated control of all the elements relating to vehicle movement, including motor torque, brakes and steering, VDIM not only optimises activation of braking, stability and traction control systems, it further improves the vehicle's overall dynamic performance. For example, when braking on a surface with unequal grip, VDIM automatically counteracts the different left and right-side braking forces to maintain straight-line braking. In the event of under or oversteer, VDIM seamlessly combines engine output and braking control to stabilise the vehicle. Moreover, via the EPS actuator, VDIM will augment VSC operation by providing steering assistance to reduce torque steer under braking on surfaces with varying grip. It will also introduce steering torque assistance in under and oversteer conditions to help the driver optimise the front wheel steering angle and maintain vehicle stability with minimum input. The RX 450h has been engineered with the express aim of achieving the highest safety performance in terms of full-frontal, offset, side and rear collisions. Beyond securing the safety of its occupants, it has been designed and rigorously tested for optimum collision compatibility with vehicles of varying height and weight, and class-leading pedestrian impact protection. Forty-two per cent of the body mass comprises high tensile sheet steel, which combines light weight with very high rigidity. In the event of a collision, impact energy is absorbed by the front side members, then dispersed through the floor members, doors and pillars. A wing bracket structure provides rigidity with effective absorption of collision impact energy. The wing brackets and radiator support upper brackets are designed with bend points to optimise their impact absorbing efficiency, and the heights of both the wing and bracket have been calculated to create a structure that will deliver effective energy absorption. A-pillar reinforcements have been increased with inner reinforcement extended rearwards. This has increased buckling strength and improved load sustainability when buckled, restricting deformation of the body around the A-pillars. The inside of the B-pillars, rails and rocker panels have been reinforced with high tensile sheet steel, while cross-member reinforcement in the roof, roof header and floor provides further protection against cabin structure deformation. The Lexus RX 450h features an impact-absorbing bonnet with a longitudinal frame structure with excellent energy absorption characteristics, achieving the highest level of pedestrian impact protection in the premium SUV segment. The strength of the bonnet lock reinforcement has been optimised through pitch reinforcement and lightening holes. An ample crush stroke has been incorporated, further improving protection while maintaining dent resistance and quiet closing quality. The Lexus RX 450h is equipped with 10 airbags, including knee airbags for both front seat occupants, front and rear side airbags and full length curtain shield airbags. The front passenger is protected by a dual-stage, twin-chamber airbag, shaped like a baseball catcher's glove to safely cradle the face and shoulders. This innovation won a breakthrough technology award in the USA. Active headrests add to the protection provided for driver and front passenger. In the event of a rear collision, the occupant's lower back presses on a mechanism built into the seatback, popping the headrest up and moving it forwards. This closes the distance between the person and headrest, minimising the risk of whiplash. The rear seats are equipped with seatbelt fastening reminders, pretensioners and force limiters. The RX 450h is built at Toyota Motor Kyushu, where, in 2008, the Kokura plant started operations as the world first factory dedicated to hybrid unit production. The plant maintains the highest standards of manufacturing quality by combining innovative production quality with the skills of takumi - the Lexus master craftsmen. Each of these elements alone is indispensable, but TMK is pursuing a synergy of the two through computerisation of master craftsmanship. By programming the sophisticated processing abilities of the skilled technicians into robots, even higher production precision is achieved. Other technologies under development include programming the takumi's sensory perceptions into measuring devices. 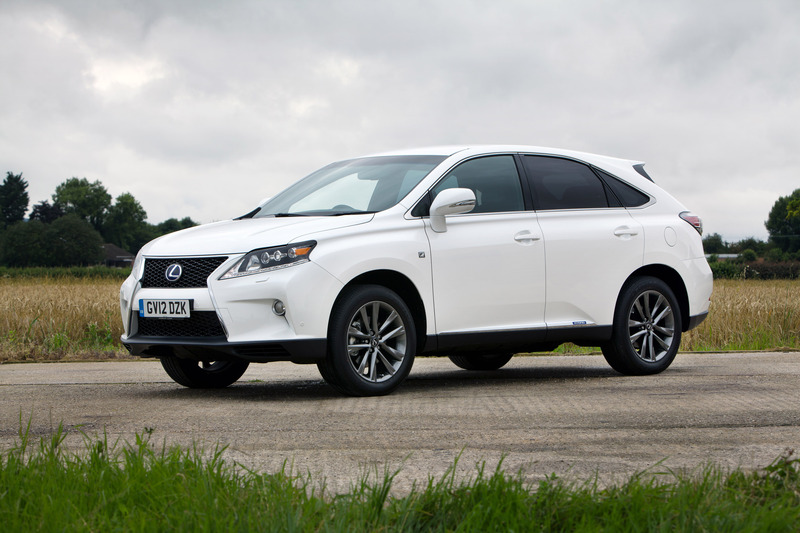 TMK is committed to reducing inconsistencies throughout the Lexus RX 450h production line. In each process, from stamping, painting and assembly, through to inspection, precise data are measured collated and managed. Measurements for each vehicle are recorded in its individual production history. By monitoring measurements in real-time, any inconsistencies or abnormalities can be instantly detected. Cross-checked against design parameters, this information is then used to hone assembly operations to achieve even greater precision. Although robots, digital devices and testing equipment are used for many of the tasks and inspections in the RX 450h assembly process, there are still many areas of manufacturing where human skills exceed even those of the most sophisticated automated systems. TMK acknowledges this by integrating Lexus manufacturing quality with a human focus on subliminal quality; those aspects of a car which cannot be measured or quantified mechanically, but which are fundamental to achieving the highest levels of perceived quality. For instance, skilled technicians are able to spot subtle imperfections that are undetectable by machines, such as small scratches, dull surface patches and gaps or misaligned panels, and meticulously put them right, one vehicle at a time. Thorough maintenance of the stamping dies is essential to the creation of a flawless bodyshell. In the stamping process, high pressure is applied to a sheet of steel sandwiched between top and bottom dies to form various body panels. If dust or other airborne particles adhere to the die surface, they can leave scratches on the panels that would be difficult to repair later in the production process. A dust particle need only measure 20 microns - about the size of a grain of pollen - to have an adverse affect on stamping quality, so stringent controls are essential to keep dust away from the stamping line. Twice a week the dies are sanded and washed at a dedicated maintenance area. This process generates large amounts of dust and to ensure this does not get into the stamping shop, the maintenance area is surrounded by a three-metre high net - nicknamed Niagara - across which there is a constant flow of water to catch any airborne particles. Using this net has reduced the level of airborne particles by more than 90 per cent, resulting in a significant improvement in the quality of stamped panels. The RX 450h's driving performance, ride comfort and quietness are underpinned by a high degree of body rigidity, a quality achieved through developments in high-precision advanced welding technologies. The bodyshells are created by the spot welding of around 300 stamped parts at 4,000 to 5,000 different points. The welding is performed by robots moving in and around the vehicle body as it is held in place by a series of jigs. The rigidity and precision of the body is determined by the number of spots the robots can reach and weld. The process for the Lexus RX 450h marks a substantial increase in the number of weld points, achieved by introducing new slim robots between the standard units. For example, in the floor and side panel tack welding process, 14 robots previously made spot welds at 70 to 80 points. Adding slim robots into this task has more than doubled the number of weld points. Careful analysis ensures the most appropriate number of welds is used for each area, not only improving body rigidity, but also sharply reducing inconsistencies in bodyshell precision. Gaps between body panels, as well as the alignment of the body and lamps, are measured on the production line with precision digital callipers. The measurements are displayed on a monitor beside the line and the vehicle body cannot proceed to the next stage until all measurement results are within the required parameters. The unparalleled surface quality of the Lexus multi-coat painting process is the product of lengthy research in coating materials and methods. Depending on the chosen colour, the number of coats and the properties of the paint used can be changed to achieve shades and depths of colour that are unique to Lexus. High quality is also achieved through meticulous cleanliness in the application process, particularly in the topcoating booths in the latter stages. Eradication of airborne particles is crucial to successful paint application. Conventional environmental control methods focused on preventing contamination at the entry and exit points to the booth, using air intake and discharge equipment. TMK has introduced a system like those used in semi-conductor factories, using a number of small, one-way air outlets to pressurise the area prior to the topcoat booth, so forcing air away from it. This approach has yielded a significant reduction in the infiltration of airborne particles. To prevent water leaks and rusting, the painting process involves sealing all body seams before intermediate coat application. Lexus's legendary attention to detail runs to applying sealant even to areas that are rarely seen by owners, such as inside the engine compartment and doors and beneath load space and cabin floors. To maintain an outstanding surface quality throughout the finishing process, the production line combines the latest robotised technology with hand polishing by master craftsmen. Vertical surfaces are water polished with a plane sander after the intermediate coat is applied, and checked both by eye and digitally. TMK is the world's only dedicated hybrid manufacturing facility, designed to provide the perfect environment for making hybrid components. Once again, minimising contamination by fine airborne particles is of paramount importance. This is achieved by atmospheric pressure control, a measure helped by the building's low ceiling design. Introducing positive air pressure inside the plant means air is constantly being forced outside the building, helping prevent airborne particles from entering. Inside, air pressure is modulated between different areas to create an air flow in the opposite direction to the manufacturing sequence. Components are conveyed to downstream processes on shuttered conveyor routes; the further downstream the process, the higher the air pressure becomes, with maximum pressure reached in the assembly process itself. Temperature and humidity are also rigorously monitored to maximise the stability of the manufacturing environment all year round. Double measures are in place at the shipping exit to prevent any foreign matter from infiltrating the plant. The loading dock is completely enclosed and a conveyor transports parts to the receiving door via an airlock. The personnel entrance is also subject to strict entry and exit controls. Workers must wear pocketless, anti-static clothing and wash their shoes. They are also prohibited from bringing in any metal items with them. Numerous 'clean and silent' initiatives are being undertaken in all TMK plants. Using a friction-driven conveyance system in the assembly process is a key contributor to a quiet factory environment. The conventional chain-driven conveyor has been replaced by a system that uses urethane rollers to move bodyshells along the assembly line; as well as being quieter, this consumes less energy and is easier to maintain. The resultant dramatic reduction in noise improves technicians' concentration, leading to improved work efficiency and precision. It also helps the technicians hear more clearly the sound their tools are making, and the sounds made when fitting connectors, which encourages greater quality and accuracy. Conversely, noises that may indicate problems are easier to discern. Air tools that are typically used for engine and underbody mounting processes have been replaced with electric nut runners, which give greater precision. Air tool technicians judge part tightening by changes in sound and vibration, but electric nut runners automatically adjust to a pre-set torque to give consistent precision and enhance body rigidity. The electric tools are also quieter and vibrate less. The RX 450h assembly process involves fitting several thousand parts to the bodyshell. Traditionally technicians collect components for fitting from racks alongside the line. By adopting the Set Part System (SPS), Lexus has eliminated the problems associated with picking the wrong parts and reduced the amount of walking necessary, thereby increasing working efficiency. With SPS, all parts required for the assembly travel along the line with the vehicle. Time spent collecting parts is minimised and the system can respond flexibly to complex part combinations. SPS has evolved further in the RX 450h door assembly line, where a gondola-type parts conveyance rack has been introduced. On a sub-line, a technician fills the gondola with the parts needed for one door, after which the gondola merges with the main assembly line, travelling along with the door to which the parts are to be fitted. Cutting-edge measuring technology is again combined with the skills of the takumi in the meticulous inspection process. Technicians conduct automated in-line measurements and quality gate checks throughout the body welding and assembly processes. Checks carried out at earlier stages are followed by a final fitting inspection in which panel gaps and alignment are checked by hand and eye. The inspectors who do this work undergo daily training and testing to maintain their skills levels. In a unique door closing speed inspection, the inspector closes all doors at a gentle speed to ensure they close firmly. The speed of closing is set at a maximum 1.2m per second and monitored by laser equipment. This speed is the equivalent of gently pushing the door with the fingertips. Lexus build precision ensures the doors can be closed firmly, even with such light pressure. After comprehensive road testing, every Lexus RX 450h is transferred to a shower test booth to be checked for leaks. This booth simulates rainfall of 200mm per hour, with water stirred to replicate storm conditions. Even a severe typhoon generates no more than 100 to 150mm of rainfall an hour, so Lexus can be confident the vehicle will not leak in even the most severe weather conditions. 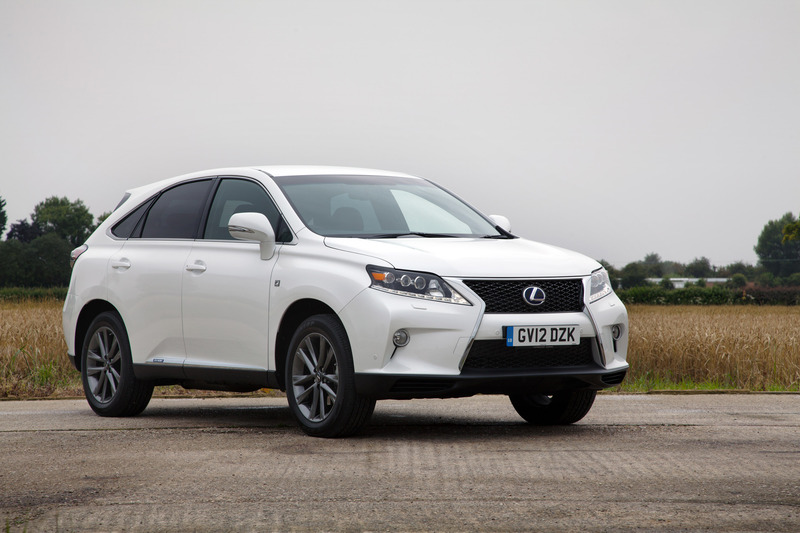 A new grade structure was introduced for the RX 450h with four trim levels: SE, Luxury, F Sport and Premier. All marked improvements in equipment specifications compared to the previous models. Entry point to the range is SE grade, with features including leather upholstery, heated and electrically adjustable front seats, dual-zone climate control, cruise control, Bluetooth connectivity, nine-speaker sound system with six-CD changer, 18-inch alloy wheels, 10 airbags, HID headlamps, rear parking monitor and automatic windscreen wipers. The Lexus Navigation System and premium ICE package are available as options. Luxury grade adds Remote Touch control, electrically operated tailgate, front and rear parking sensors, Lexus Navigation System, 12-speaker audio system and 19-inch alloy wheels. Options include a sunroof, premium ICE package, DAB audio and interior wood inserts. The top-of-the-range Premier version comes with air suspension, head-up information display, semi-aniline leather upholstery, heated and ventilated front seats, LED headlamps, illuminated front scuff plates, smart keyless entry and push-button start, side view camera, 15-speaker Mark Levinson audio with six-DVD changer and DAB module for digital radio reception. Options include the Wood Package, panoramic sunroof and premium ICE. Lexus's Pre-Crash Safety system and Adaptive Cruise Control, sunroof, and Head-Up Display, with the Wood Package optionally available. The RX 450h adopts a whole new sporty persona with the introduction of an F Sport version to the RX range for the first time, offering both sharper looks and performance. Style-wise the F Sport stands out with a deeper, more vertical front bumper and a dedicated mesh treatment for the upper and lower grilles, which together make the new spindle grille shape an even stronger feature. There are also dark-finish 19-inch alloy wheels and F Sport badging on the exterior, while in the cabin the model's distinctly sporting character is reflected in aluminium-effect sports pedals and trim inserts, F Sport smooth leather upholstery and scuff plates with the Lexus logo in black. There is also a black roof lining and a bespoke steering wheel with a stitched leather trim. Other equipment features include a head-up display, and LED headlights with the I-AFS adaptive system that angles the light beam in line with the vehicle turning angle through bends and at junctions. 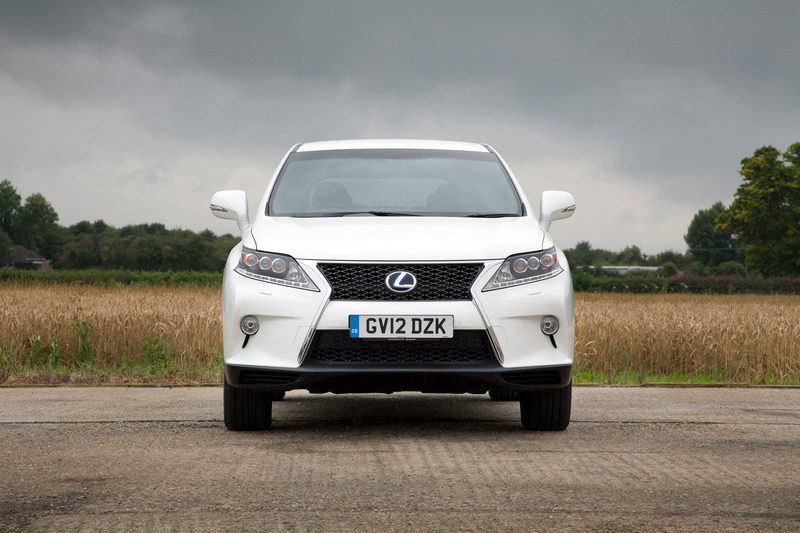 The Lexus RX 450h's 145g/km CO2 emissions yield on-going benefits for both private and fleet/company car drivers, breaking new ground for the premium SUV section by qualifying for road tax/Vehicle Excise Duty of just £125 for the first year of ownership (Band F rating). Fleet operators have the added advantage of a 20 per cent Write Down allowance which, together with better fuel economy and the favourable BiK rate can produce significant savings over three years or 60,000 miles compared to its principal competitors.